LOS ANGELES — The next-generation Deep Orange 3 concept vehicle, sponsored by Mazda and engineered by automotive engineering students at the Clemson University International Center for Automotive Research (CU-ICAR), is on display at the LA Auto Show. The Deep Orange program showcases advanced vehicle technologies and provides students an opportunity to work directly with automotive industry partners to innovate and develop ideas. Deep Orange 3, a unique six-seat sports car, features a unique hybrid powertrain that automatically chooses front-, rear- or all-wheel-drive; a load-bearing structure based on innovative sheet-folding technology patented by Industrial Origami; and a groundbreaking 3+3 seating configuration in sports car architecture. The vehicle’s prototype chassis was unveiled during last year’s SEMA show, minus the body panels. 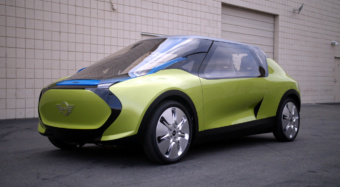 The vehicle’s panels were designed by Frederick Naaman when he was a student at the Art Center College of Design in Pasadena, Calif., a CU-ICAR partner. The car returned to SEMA this year as a completed vehicle. Paul Venhovens, BMW Endowed Chair in Automotive Systems Integration at CU-ICAR, who leads the Deep Orange program, said Clemson University has designed a curriculum in automotive engineering like no other, making it one of the most exceptional, hands-on programs in automotive engineering. In essence, Deep Orange project is set up as a car company, Venhovens said. “We strongly feel certain elements of the automotive industry require change to create a more sustainable industry,” Venhovens said. “We believe in open innovation platforms and looking at disruptive approaches to building the cars of tomorrow. The vehicle is on display in the Design Gallery. CU-ICAR is a 250-acre advanced-technology research campus where university, industry and government organizations collaborate. Clemson’s College of Engineering and Science offers master’s and Ph.D. programs in automotive engineering at CU-ICAR and is conducting leading-edge applied research in critical areas, such as advanced product-development strategies, sustainable mobility, intelligent manufacturing systems and advanced materials. CU-ICAR has industrial-scale laboratories and testing equipment in world-class facilities available for commercial use. As part of the graduate automotive engineering program at CU-ICAR, students are required to create and manufacture a new vehicle prototype. The vehicle’s concept and design is developed in partnership with students from the Transportation Design department at Art Center focusing holistically on the vehicle and the end-user. The program provides students with experience in vehicle design, development, prototyping and production planning. Each year, a prototype vehicle is developed with a new market focus and technical objectives. The project showcases advanced vehicle technologies and provides students an opportunity to work directly with automotive industry partners to innovate and develop ideas.